Definitely not a list of articles we are publishing. No – the Underground is not anti-SCSU. As the Editor-In-Chief, I believe in the purpose and existence of a student’s union. The SCSU can have real, tangible, benefits on the lives of its members. Furthermore, they’re our strongest bargaining power as students on the UTSC campus. However, I am anti-tomfoolery, and the Underground will continue to challenge any organization on this campus, student society or otherwise, who does not live up to their mandate. Including ourselves, as evident in my “Underground review” article. Did the UG fail on their background research for SCSU’s actions on food quality? This is in response to a comment made on Facebook on our post re: ‘Empty Stomachs and Empty Promises’ our follow-up to the first Asian Gourmet article. I felt that rather than responding to the individual, the entire student body deserves an answer. I stand by what my Managing Editor wrote. The student outlined that our article was incorrect as we: A) cited SCSU’s inaction; and B) our article was ineffective as it was a complaint, whereas the more effective route is to email the union representatives. In reference to A) our “false” citing of SCSU’s inaction. This individual referred to a food-user committee, where in their most recent meeting, the SCSU updated the steps they’ve taken to address issues, and further presented those in front of multiple UTSC stakeholders. I respectfully disagree that the SCSU’s above actions are an adequate and appropriate response to the growing food issues on campus. A) The Food User committee is not a publicized committee. I contest the notion that an open committee is by default a publicized space. I’d argue that 95% of the student body is not aware of the existence of such committee. B) At the time of publishing ‘Empty Stomachs and Empty Promises’ the SCSU had not published a public statement on their acknowledgement of poor food quality and food issues at Asian Gourmet and Rex’s Den, nor cite their intended actions. i. This is in violation of a motion passed at the October board of directors meeting. C) Moreover, I’d argue that the SCSU Executives themselves are unaware of such a committee, as they amended and supported a motion to create a committee on assessing food issues on campus. ii.) If the Food User committee is the space for that, and the Executives are aware, why would they support the creation of an additional committee? iii.) Further, why would they spend a majority of the Board Meeting arguing against the inclusion of the Operations Coordinator, if he’s very obviously the subject-matter-expert (SME), as he presented to the Food User committee. i.) Why was this information not shared at the board meeting? ii.) Where is the plan of action? iii.) Why has it not been shared with students? Either the SCSU Executives knew about the Food User committee and purposefully left it out of the board meeting, or they had no idea that such a committee occurred – and honestly, I don’t know what’s worse at this point. Either our student union is going to great lengths to avoid being transparent with its membership, or our supposed “student leaders” are incredibly incompetent. The incident at Asian Gourmet occurred on/around October 15th. It apparently took fifteen (15) days for our student union to discuss it in some capacity and even then, it was at an unpublicized, yet open, committee, in which the speaking authority on student’s behalf was a non-unionized full-time staff member. The only other place where it was discussed – and once again, in an unpublicized, yet open, board meeting – it focused on the assembly of a committee and provided students with no tangible answers or plan of action. The response to inaction simply cannot be ineffective action. What happened to the old Underground website? I’m sorry to say, but the old Underground website and all its information was deleted. This was not at my direction, but rather the previous Editor-in-Chief Kristina Dukoski and financial officer Matthew Diaz. These folks neglected their duties to the Underground. One of those many duties was in regard to the bill for our website. It clearly indicated that failure to pay would result in the deletion of our website, all our content, and the loss of our domain. And that’s exactly what happened. The loss of hundreds of articles, pictures, historical content – people’s sweat and tears – all gone. Why is the Underground team so small? And are you hiring? You do not need to be a journalism/English student to work at the Underground. Nor do you need to necessarily agree with any of the viewpoints we’ve made thus far. We encourage everyone to apply – even those who disagree with any work we’ve published thus far. On the first notion, the team has been small thus far for two reasons. 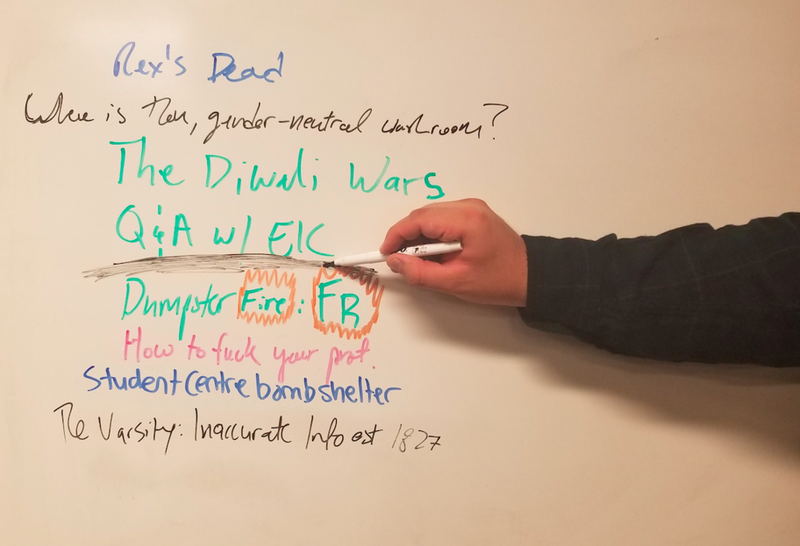 First, last year’s wonderful Editor-In-Chief and financial officer were non compliant with virtually every financial (and honestly, moral) principle laid out by the Vice Provost’s office in regard to student societies. This meant that for a very long time we were unsure about our funding, and whether or not we could operate. We had a plan B in that case, but thankfully we were able to resolve the majority of issues and begin operating. In fact, for roughly seven months (till January) we operated with zero funding. Second, part of our transition to an online, no sections model, required a steep transition period, that was really “learn as you go”. This meant we were unsure of what positions we’d need to sustain our new model. We’ve gone through that initial learning period, and we are ready to onboard a larger team, and hit the ground running. Why should I trust the UG? We are independent of the SCSU and the University of Toronto. Ultimately we are a group of passionate individuals who are attempting to provide a contribution to this campus through the form of a publication. Our goal is to challenge ourselves, the university, and other student societies and clubs on campus; while providing concise, detailed, information to the student population on a variety of matters. I don’t like what the UG wrote, what do I do? We accept all viewpoints, and invite you to contribute an op-ed, on why what we wrote was either false, or why you disagreed with it. We want students to be able to critique us, engage in dialogue with us, and provide a range of services to students that extend beyond publishing a monthly magazine. An example of that, is we are working on a proposal to implement more seats in the upper-level of the student centre. Can we sit outside your door? No [you know who you are]. Do you have office pets? We definitely do not not have office pets. No narcs allowed.